BANGKOK, Dec 19  India regained the mens hockey gold after 32 years today to provide the perfect icing on the contingents show in the Asian Games here. India battled hard against holders South Korea before clinching the gold with a 4-2 win. BANGKOK, Dec 19  Indias Ashok Shandilya upset world professional billiards champion and compatriot Geet Sethi 5-4 to win the billiards singles title at the 13th Asian Games here today. Relay team grabs silver BANGKOK, Dec 19  The male quartet broke the national record by a long way as India completed a superb double silver medal heist in the longer relay on the final day of the Asian Games athletic competition here today. India, registering a fine show completed a haul of two gold, four silver and seven bronze medals which also accounted for the majority of medals won by the country.The womens relay quartet, inspired by a splendid opening lap by Young Jincy Philips who had replaced veteran P.T. Usha, completed a fine job to clinch silver after double gold medallist Jyotirmoyee Sikdar found the Chinese anchor Chen Yuxiang too hot to overhaul in the final metres. BANGKOK, Dec 19  India scooped up their second bronze medal from the Asian Games rowing competition when the mens open class coxwainless fours team finished third in 6 minutes, 25.28 seconds behind champions China and runners-up Japan. NEW DELHI, Dec 19 - Only Doordarshan could have dashed the hopes of millions of Indians the way it did on Saturday evening as the country emerged as the Asian giants in hockey after a long wait of 32 years. Cobra blood key to gold? BANGKOK, Dec 19  With the curtain set to come down on the 13th Asian Games tomorrow, China have an unassailable lead in the medals table followed by South Korea and Japan. BANGKOK, Dec 19  Iran won the Asian Games soccer gold medal in a canter today, beating Kuwait 2-0 in a game played under the shadow of extra security because of US-led bombing raids on Iraq. DUNEDIN, Dec 19  Inclement weather ruled out play for the second successive day today on the second day of the first Test between India and New Zealand here even as the tourists took strong objection to the Kiwi coachs reaction to their rejection of proposals to have an extra days play. CALCUTTA, Dec 19  Chief national soccer coach Syed Nayeemuddin yesterday said the Indian team could have done better in the Bangkok Asian Games with better preparation and more international exposure. HOBART, Dec 19  Mark Waugh and Shane Warne will give evidence by video link to the Pakistan cricket bribery enquiry next week, officials said today. BANGKOK, Dec 19 (PTI)  India regained the mens hockey gold after 32 years today to provide the perfect icing on the contingents show in the Asian Games here. India battled hard against holders South Korea before clinching the gold with a 4-2 win in the nerve-wracking penalty-stroke tie-break duel after the teams were locked 1-1 after 70 minutes of regular time and 15 minutes of extra time. It was at this Thai capital that the Indian men had won their one and only Asian Games crown, way back in 1966, by beating arch-rivals Pakistan 1-0. India have settled for the runners-up position to the Pakistanis, barring that lone triumph, ever since the sport was introduced at the Asian Games in Tokyo in 1958 until South Korea upset all calculations by edging out both the sub-continental hockey giants for the gold at home in 1986. India had won the bronze in 1986 at Seoul and then were confined to the silver standard in 1990 at Beijing and in 1994 at Hiroshima before regaining the title today to round off an outstanding tournament where they emerged victorious in all the matches at the league and knock-out stages. The Indians had beaten the Koreans in the league stage before providing an encore in the all-important final when veteran Mukesh Kumar pushed in a weak grounder to the left of the Korean custodian in the "strokes" duel and sealed the win. The hockey feat outshone the two silver medals won by the Indian mens and womens 4 x 400m relay quartets and the rowing bronze won in the morning by the mens coxless open fours. It also took the Indian gold tally to six on the penultimate day of the games. Goalkeeper Ashish Ballal was the Indian teams hero in its hour of glory when he stopped two penalty-stroke pushes from Koreans Yoo Moon-Ki and Jeong Jin-Dong to provide India not only the gold but also a ticket to the 2000 Sydney Olympics. The Indians converted all four penalty-strokes to claim their first major hockey title since winning the 1980 Moscow Olympics gold. The match was fast-paced with the Koreans going in front in the fifth minute through a penalty corner goal from Yeo Woon-Gon. Indian skipper Dhanraj Pillay neutralised the Korean lead in the 23rd minute by scoring off a penalty-corner rebound from Korean Keeper Koo Jin-Soos pads. The teams were then deadlocked for the remainder of regular time and extra time where the golden goal rule was in force. "This is the greatest moment of my life", said Pillay who played a major role in the teams triumph by notching eleven goals in the competition. Earlier, India secured two relay silvers when the mens and womens 4 x 400m quartets finished second to end their athletics campaign with an overall tally of two gold, six silver and 6 bronze medals. The Indian women, without former Asian quartermile queen P T Usha in their ranks who was left out by the team management, failed to land the gold as expected and finished runner-up to China by clocking 3 minutes, 32.20 seconds which was 0.17 seconds off Chinas winning time of 3:32.03. Jincy Philips, who replaced Usha in the quartet, ran the first leg for India with M Beenamol and Rosa Kutty as the second and third leg runners while 800-1,500m gold medallist Jyotirmoyee Sikdar handled the anchor leg to push Kazakhstan (3:37.16) to the bronze level. The mens relay foursome of Lijo David, P Ramachandran, Paramjit Singh and Jata Shankar gave gold medallists Japan a close fight before settling for the silver with a new national record of four minutes, 2.62 seconds which lowered their own mark of 4:04.56 set in the semifinal heats yesterday. Indias hopes of more medals from the track and field events were dashed when Gulab Chand, the mens 10,000m bronze medallist, ended up fourth in the 5,000m, while men javelin throwers Satbir Singh (75.21 metres) and Jagdish Kumar (72.03m) finished sixth and eighth out of eleven competitors. India had started the penultimate day of the games on an encouraging note by winning a bronze in rowing through the quartet of Birbal Singh, Jagit Singh, Johnson Xavier and Tarlochan Singh. India scooped up their second bronze medal from the rowing competition when the mens open class coxwainless fours team finished third in 6 minutes, 25.28 seconds behind champions China and runners-up Japan. Yesterday the rowers had picked up their first medal when the quartet of Kurien Kaleekkalethu, Kasam Khan, Pappi Singh and Rampal Singh clinched the bronze in the mens lightweight coxless fours event. The Indian foursome clocked 6 minutes, 11.48 seconds to finish third behind gold medallists China and second-placed Japan. CHANDIGARH, Dec 19  India's first win in the Asian Games hockey competition in 32 years and second since the inception of the tournament has been hailed by a number of Olympians, ex-internationals and sports administrators. Former Indian captain Pargat Singh said that it was a "day for celebrations as India desperately needed to win a title like the Asian Games gold". Congratulating members of the Indian team on their "superb performance", Pargat said that their gold medal would serve as a milestone for reviving this game in the country which otherwise has been dying a slow death. Olympian Surinder Singh Sodhi said that "it is a red letter day in Indian hockey." The boys deserved to be congratulated for bringing honours to the country. "The win is not only a morale booster, but also saves the country from the agony of playing the qualifying tournament for the 2000 Olympic Games." Hardeep Singh Grewal, also an Olympian, said that the win at Bangkok today would provide the necessary motivation for youngsters to continue with this game. Participation in the game, which had been on the decline, would again get a fillip after our golden triumph today, he added. Former international player and coach Sukhvir Singh Grewal described the second successive win against South Koreans in seven days as "splendid" and congratulated both the coach and players for their excellent showing. "This win was badly needed. We should not allow this win to make us complacent as we have tougher challenges ahead. Our goal should be to do well in Olympics," he added. Two of the oldest Olympians  Tarlochan Singh Bawa and Dharam Singh  also congratulated the Indian team on its "golden triumph". Former international Gurdishpal Singh said that the "triumph at Bangkok was an indication that Indian hockey can be on winning track again. All we need is to be sincere in selecting, training and motivating our teams going abroad to participate in international events." Congratulating the IHF, the team management and members of the triumphant team, Gurdishpal Singh said that the players should be suitably rewarded for their "heroic performance". Olympian Jagdeep Singh Gill said that it was after a long time that India played like a team in an international event. Congratulating Dhanraj and his team, Jagdeep said that "India needed a triumph like this badly. Otherwise, people were gradually losing interest in the game. At Bangkok, both men and women teams have given a good account of themselves to justify hockey's position as national game." Mr Teja Singh Dhaliwal, a sports organiser, said that it was a "golden day" in the history of Indian hockey as it was only second time in 40 years that India won a hockey gold in Asiad. The government must reciprocate by providing more synthetic playfields to give the necessary boost to the game after this historic triumph, he added. Olympian couple - Gurmail Singh Rai and Rajbir Kaur  also complimented both men and women teams for their splendid showing at Bangkok. Olympian Balwinder Singh said that it was after a long time that those who played or are associated with the game can "rightfully rejoice" at good performances by both men and women teams. BANGKOK, Dec 19 (PTI, UNI)  Indias Ashok Shandilya upset world professional billiards champion and compatriot Geet Sethi 5-4 to win the billiards singles title at the 13th Asian Games here today. In an all-India affair, Shandilya got the better of Sethi in a tense marathon final and emerged victorious. Praprut beat Grandea 4-1 to claim the bronze medal. Sethi and Shandilya had earlier won gold in the billiards doubles event. Earlier India ensured a gold and silver in the billiards single as world champion Geet Sethi and Ashok Shandilya entered the finals in contrasting styles at 13th Asian Games here today. While Sethi easily outsmarted Reynaldo Grandea (Philippines) 150-33, 150-0, 151-83, 152-119, Shandilya defeated local hero Chalthanashri Praprut 151-108, 151-134, 78-151, 150-70, 151-97. Even before Shandilya and Praprut completed their third frame, Sethi completed his rout of the Filipino as he started with a rousing 66 break in the first frame and followed it up with a 150 and 151 in the second and third frames. However, in the third Grandea started with an 83, but that did not endanger the prospects of Sethi. The fourth saw the Filipino trying to come up with some good short breaks of 34 and 36. But through his slow and steady potting, Sethi won the frame and the match in no time. Shandilya, who was merely a spectator in the doubles in which Sethi played an outstanding game, came off with a much-improved performance against his tough Thai opponent. Praprut had been assured of a house and a car besides one million bhats if he earned the gold. The first frame saw Praprut come off with a 101 break but that did not unnerve Shandilya who missed a three figure break by two points and took the frame at 151-108. The Thai, however, bounced back into the game in the third frame and with a break of 127 he won it to reduce the margin by one frame. However, the next two frames saw Shandilya at his best as he capitalised on the mistakes of the Thai cueist to win them and make his entry into the final. BANGKOK, Dec 19  The male quartet broke the national record by a long way as India completed a superb double silver medal heist in the longer relay but hopes of one in the mens 5,000 metres evaporated when Gulab Chand was pushed to fourth on the final day of the Asian Games athletic competition here today. India, registering a fine show completed a haul of two gold, four silver and seven bronze medals which also accounted for the majority of medals won by the country. Producing one of the most outstanding performances for India before a packed crowd at the Thammasat University the Indian quartet of Lijo David Thottan, P. Ramachandran, Paramjit Singh and Anchor Jata Shankar even raised gold medal hopes by leading into the final leg before coming second behind Japan, who set an Asian Games record of three minutes 01.70 seconds to land the gold. The Indian quartet, who were just into medal reckoning after Sri Lanka failed to qualify due to a batan drop by their anchor in the semifinals, ran like men possessed to clock a brilliant 3:02.62, which improved by almost two seconds the existing record of 3:04.91 set by the same four at Calcutta last month to qualify for the games. The superlative effort pushed silver hopefuls Korea to third at 3:05.72 with another strong contender Qatar trailing in sixth. The womens relay quartet, inspired by a splendid opening lap by Young Jincy Philips who had replaced veteran P.T. Usha, completed a fine job to clinch silver after double gold medallist Jyotirmoyee Sikdar found the Chinese anchor Chen Yuxiang too hot to overhaul in the final metres. 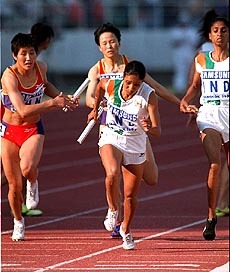 The Asian champions clocked 3:32.03 while the Indian quartet- Jincy Philps, K.M. Beenamol, Rosa Kuttty and Sikdar-returned 3:32.20 with Kazakhsthan, which held an early lead, taking bronze at 3:37.16. But India had disappointment in the mens 6000 metres where 10000 m bronze medallist Gulab Chand ran out of steam to be pushed to fourth in the last 30 metres while veteran Bahadur Prasad found the early pace too tough in the hot and humid afternoon weather to fade away to eighth. They also fared poorly in the mens javelin with national record holder Satbir Singh coming sixth at 75.21 and Jagdish Bishnoi finishing eighth 72.03. Qatars Mohammad Suleiman completed a grand 1500-5000 double by displaying much in reserve to clock 13:55.79 while Gulab Chand, who ran his second sub-14 minute race timed 13:59.20. Ahmed Ibrahim made it one-two for Qatar while Baok Seung-Do had just that much in reserve to outpace the Indian and clinch bronze at 13:57.11. BANGKOK, Dec 19 (PTI)  India scooped up their second bronze medal from the Asian Games rowing competition when the mens open class coxwainless fours team finished third in 6 minutes, 25.28 seconds behind champions China and runners-up Japan. The quartet of Birbal Singh, Jagjit Singh, Johnson Xavier and Tarlochan Singh became the second bronze Indian medallists in the rowing competition after the mens lightweight coxless foursome of Binu Kurien Kaleekkalethu, Kasam Khan, Pappi Singh and Rampal Singh yesterday. Chinas Zhang Binggui, Dai Haizhen, Sun Jun and Nie Junliant picked up the gold clocking 6:15.97 with Japan taking the silver by finishing far behind in 6:21.15. The Indian open class coxless quartet had given a creditable display on Thursday to qualify for the final by finishing second in the repechage race at the Map Pracham reservoir. The foursome had clocked 6 minutes 17.54 seconds on Thursday, eight seconds better than what they did today, to finish behind eventual silver medallists Japan and qualify for the final. China swept all the eleven gold medals at stake in rowing by taking six titles on offer today after clinching all five yesterday. It was the third clean sweep by China in rowing following the feats in 1982 at New Delhi and 1990 at Beijing. The Chinese juggernaut today won all the six races, three each in the mens and womens sections, with a commanding margin. The rowing team even had a stint of training with controversial athletics coach MA Junren, according to reports. Xinhua adds: Zhang Quing, the Director of Chinese Aquatics Sports Centre, said: "The results are quite satisfying. The most important thing is all our rowers are in high spirits this time. Olympic silver medallist Zhang Xiuyun, who won the gold here in the womens open class single sculls, said the competition in Asia was an easy job for her. "I was quite relaxed and felt no pressure. The competition was not tough for me," she said. Other Chinese rowers might feel the same way as they met no serious challenge in the races. Zang Qing said that was because Japanese rowers failed to put up a good performance. "Now its clear China holds an obvious advantage in Asian rowing, he added. NEW DELHI, Dec 19 - Only Doordarshan could have dashed the hopes of millions of Indians the way it did on Saturday evening as the country emerged as the Asian giants in hockey after a long wait of 32 years. With millions of viewers glued to TV sets to watch the medal distribution ceremony, the thrill of the hoisting of the Indian Tri-Colour and the National Anthem being played, the national television let everyone down switching off the live telecast due to completion of satellite booking time. Just when the viewers were soaking themselves in the joyous atmosphere at the hockey stadium at Bangkok with the Indian supporters present in large numbers to cheer the victorious team, the commentators poured cold water to abruptly delink them. They announced that since the timing for the satellite booking had run out they were not in a position to telecast live the most important portion of the Indian victory. Coming as it was after 32 years, the Indian victory in the Asian Games hockey competition would be cherished for a long time not only by the "Dhanraj Pillay boys" but also by millions of Indian hockey fans who watched their country regain past glory. It is not always that Indians get to see such occasions and bask in glory and national pride. But gold capping of the Indian victory was snatched from the Indian viewers by the ill planning by Doordarshan. This is not the first occasion that Doordarshan has played truant with the Indian hopes and viewers. On many a occasion during the final stages of Indian victory in cricket matches, the Doordarshan has left Indian viewers high and dry. But on this occasion, it could have been better prepared as the Indian win would have meant a special occasion for the country. Is it that the officials at the Doordarshan were not expecting an Indian victory or that the national television was trying to save money as usual? Would the custodians of the Information and Broadcasting Ministry care to reply? Cobra blood key to gold? BANGKOK, Dec 19 (Reuters)  With the curtain set to come down on the 13th Asian Games tomorrow, China have an unassailable lead in the medals table followed by South Korea and Japan. Sports analysts might attribute the success of these Asian powerhouses to hard training and the latest sports technology, but a Thai restaurateur thinks otherwise. He believes the secret lies in the exotic dishes, including cobras blood and cobras gall bladders, winning athletes have been eating at his restaurant near the main games complex on the outskirts of Bangkok. Rerng Rerklai, (64) a former mercenary in the Indo China war says many athletes from China, Japan and South Korea became regular customers during the games. "They came to my restaurant at night after the games and ordered cobra, either in soup, in a curry, or fried," he told Reuters. "But they usually have the gall bladder fresh, mixed with blood and whisky. "The people from these countries believe eating cobra make their eyes brighter and gives them extra energy to make them stronger and live longer," Rerng said. Such potent potions do not come cheap, however. One cobra, complete with gall bladder and blood, goes for 1,500 baht ( $ 4), Rerng said, adding that he had sold six or seven each night since the games began. Although cobaras are indigenous to Thailand, conservationists say they have become an endangered species and have mounted compaigns to discourage people from eating them. BANGKOK, Dec 19 (Reuters)  Iran won the Asian Games soccer gold medal in a canter today, beating Kuwait 2-0 in a game played under the shadow of extra security because of US-led bombing raids on Iraq. The outcome of the all-middle east final, played on the first day of the holy Muslim fasting month of Ramadan, was never in doubt even when the Iranians had a player sent off late in the match. Iran, with most of their World Cup squad on display, took control from the start going into the lead in only the seventh minute. Left Wing Back Ali Karimi, a rising 21-year-old star who was playing in the Iranian third division only a few months ago, popped up unmarked at the right hand far post to nod home a corner which Kuwaiti goalkeeper Khalid Al-Fahdli should have kept out. Kuwait, the Gulf champions, were missing key goal scorer Jassem Al-Huwaidi with a thigh injury and could not break the firm grip the hard-working Iranian midfield had on the game. Their defence also was in trouble without kingpin Mohammed Khakpour. Iran extended their lead in the 27th minute as Karim Bagheri of German second division side Arminia Bielefeld won yet another ball in midfield, charged through a static Kuwaiti defence and rounded Al-Fahdli before firing home from a narrow angle. Four minutes later, it should have been all over as Bayern Munich striker Ali Daei put Ali Mousavi through, but poor ball control on a bumpy pitch gave Al-Fahdli enough time to block the eventual shot. Karimi also went close in the 34th minute as Al-Fahdli again dithered over whether to come out for a corner kick, but the Iranian defenders header was cleared off the line. The Iranians eased off in the second half, but Kuwait still could not threaten to score and 19-year-old Farj Laheeb, the tournaments top scorer, rarely got a touch of the ball and never a chance to add to his nine-goal tally. Not even the sending off of Irans Mehdi Madhavikia, a striker playing at wingback who has interested several European clubs, helped the Kuwaiti cause. Madhavikia was sent off in the 78th minute after he raised his leg high in the air to make a running interception and felled Kuwaits Ahmad Al-Mutairi, who was carried off and did not return. The Kuwaitis managed to get into the Iranian penalty area after that, but still could not find a move that would threaten goalkeeper Behzad Gholampour, who has looked fallible throughout the tournament. The Iranians, who never looked vulnerable after a stunning 4-2 defeat at the hands of tiny Oman in a second round group match, happily claimed a gold medal they last won in 1990 at the Beijing games when they were just emerging from a decade of war against Iraq. SONGKHLA (Thailand): Thailands soccer team took their last bow at the Asian Games today after 3-0 defeat by China in the play-off for third place crushed their medal hopes for good. But it was Thailands English coach Peter Withe who led the lap of honour around the 20,000 seat stadium in the coastal resort of Songkhla, as the crowd rose to their feet in appreciation for their teams efforts at the games. Chinas English coach Bob Houghton joined in the applause. Thailand got off to a ferocious start and caught China napping with a series of darting runs which pierced their defence in the first 15 minutes, leaving only the goalkeeper to beat. But time and again the ball sailed over the bar or skimmed wide of the post. "We had five or six good chances but we just couldnt convert them," Withe told reporters. "Goals change games." The Thai team kept up the pressure through most of the first half until a bizarre ruling that Thai goalkeeper Chaiyon Khumpiam had held the ball for more than 10 seconds gave China an indirect free kick in the penalty area, which captain Fan Zhiyi put away in the 25th minute. The blow seemed to knock the wind out of the Thai team, and China turned up the heat in the second half with a series of neatly worked assaults that eventually put Wang through for a second goal. Some brilliant reflex saves from the Thai goalkeeper prevented China from adding at least another two midway throug  the second half, but nothing could stop a blistering 15-metre power drive from Ma Mingyu which sealed the game for China in the final few minutes. DUNEDIN, Dec 19 (PTI) Inclement weather ruled out play for the second successive day today on the second day of the first Test between India and New Zealand here even as the tourists took strong objection to the Kiwi coachs reaction to their rejection of proposals to have an extra days play. Continuous overnight rain and intermittent drizzle in the morning that turned into a heavy downpour by the afternoon lashed the Carisbrook ground rendering it absolutely soggy. To add to the concern of the groundstaff a part of the sheets covering the bowlers run-up had blown off dampening the area behind the stumps. With dark clouds hovering ominously over the city skyline, players of both teams chose not to leave their hotel rooms even as the Indians fretted about New Zealand coach Steve Rixons comments on their rejection of the "Test saving proposals" from the host cricket board. Taking strong exception to Rixons remarks questioning the visitors attitude, the Indian team management forced a meeting with New Zealand Cricket Board Chief Executive Christopher Doig today and lodged a protest with him. It is believed the Indians  represented by manager S.D.A. Dabru, coach Anshuman Gaekwad and captain Mohd Azharuddin  went to the extent of demanding an apology from the former Australian wicketkeeper Rixon. Though Doig did not promise anything of the sort, he agreed to convey their feelings to the Kiwi team management and Rixon in particular. Commenting on Indias refusal to agree to have an extra days play and extension of play each day to make up for time lost due to weather conditions and to play under lights, Rixon had said yesterday, "I am disappointed because I dont understand their thinking. We are supposedly the underdogs and I thought they would have wanted as much play as possible. "We have an in-built philosophy that we want to play if at all possible. You cant win too many games sitting in the dressing room." During their meeting with Doig, the Indians emphasised the point that this year they have been winning matches and not "sitting in the dressing room". "How fair is it to burden the cricketers with so much of workload (three tests in 18 days) when there is so much of cricket already," Dabru said. "As far as I can see, the boys will be getting only a days off from cricket, practice and travel on this entire tour and that is on the 24th of this month." Doig reportedly pointed out the need for New Zealand cricket to get as many days of play as possible during the summer because, except for Basin Reserve in Wellington, the rest of the grounds double up for rugby and other sports. Doig is reported to have said they have commitments to the sponsors and all those who are supporting New Zealand cricket and the remarks reflected the frustration owing to lack of play. The Indians, it is learnt, also did not like match referee Barry Jarmans stance on the issue. Jarman, a former Australian wicketkeeper, had favoured the Kiwi proposal saying: "I think it is a good experimental law which is for the betterment of the game. You never know, India may well regret turning it down beacuse they might be needing just a bit of extra time for result on the last day." He said India had also declined to play under lights against South Africa in Durban last year when conditions became murky. "I think you have to think of the people watching the game, whether its at the ground or on television," he said. The feeling was unanimous in the Indian camp that Jarmans views did not look like that of a neutral umpire, more so of an ICCofficial. One senior Indian cricketer remarked, "It would be interesting to find out if similar proposals of extending play or making up for lost time is made when the South Africans are here." CALCUTTA, Dec 19 (PTI) Chief national soccer coach Syed Nayeemuddin yesterday said the Indian team could have done better in the Bangkok Asian Games with better preparation and more international exposure. "We went to Bangkok with all the problems, but still played well. I will say the boys have put up a great performance," Nayeemuddin said of the Indian team, which made it to the second round before going out of reckoning. Talking to reporters here, Nayeemuddin said the team, which was cleared for Bangkok at the last minute on a no-cost-to-government basis, did not get enough time to train ahead of the games. "In future we have to undertake long-term preparations. We are not at all lagging behind the best Asian teams either technically or physically, and are capable of doing one thousand per cent better," he said. "We are even capable of beating teams like Kuwait and Thailand," the Dronacharya awardee said. India bowed out in the round of 16 and though they lost all but one match in the tournament, their gritty display earned them acclaim from both soccer pundits and the media in Bangkok, he added. He suggested that in future teams be sent to major tournaments a month in advance so that the players could acclimatise themselves to an alien climate and grounds and also play some practice matches prior to the tournament. "In Bangkok, most of the teams India crossed swords with, we were playing for the first time in the recent past. "Moreover, some of the players were last-minute inclusions. Can you imagine a guy playing his first match for the side against a team of Japans calibre? Nayeemuddin asked. He said if the All-India Football Federation (AIFF) desired it, he would submit a report on the Indian teams performance after discussing the matter with manager Chuni Goswami. He answered in the negative when asked if he had received any intimation from the AIFF on his team being extended, but said he was willing to continue. On his reported differences with striker Baichung Bhutia, he said he had nothing against the star striker. "He is like my son. But I am not happy with the performances of I.M. Vijayan and Baichung. Though they tried hard, they were not in the peak of form and fell short of expectations", he said. India could have forged into the lead against Turkmenistan, but for Bhutia, who missed gilt-edged chances, Nayeemuddin said. India eventually lost the match 2-3. He also said some senior players needed to be more serious during practice sessions. HOBART, Dec 19 (AFP)  Mark Waugh and Shane Warne will give evidence by video link to the Pakistan cricket bribery enquiry next week, officials said today. The exact time and place for the Australian players to give evidence had not yet been finalised, an Australian Cricket Board (ACB) spokesman said here. The ACB has been negotiating with Pakistani judge Malik Mohammad Qayyum over his request to re-examine the pair following their admission that they took money to provide a bookmaker with information about pitch and weather conditions during Australias 1994 tour of Sri Lanka. Neither the ACB nor the players had been keen for their return to Pakistan to give evidence. The spokesman said the ACB had heard back from the judges office overnight agreeing to a video link which will enable Qayyum to question them. The spokesman said all the details had not been worked out and he did not know if the evidence would be given in public. CHANDIGARH, Dec 19 (BOSR)  Superb batting by Kulwant Singh who scored 173 runs off 79 balls, enabled Panther Star Cricket Club to defeat Falcon Cricket Club by 21 runs in the Bathany Cup Cricket Tournament at CRPF ground-today. Brief scores: PCC: 240 for nine in 25 overs. (Kulwant Singh 173 n.o. Tilak Raj 18, Surinder 17, Ansari 3 for 25). FCC: 219 for eight in 25 overs. (Deepak 65, Rajesh 30, Jasbir 29, Sarbjeet 22, Anil 2 for 34, Sanjeev 3 for 41). CHANDIGARH, Dec 19 (BOSR)  CNS XI trounced JAL XI by 44 runs while Gymkhana CC XI defeated PGI XI by 39 runs in the Adhunik Cup League Cricket Tournament at the PGI ground today. Brief scores: 1st match - CNS XI:- 150 for 9 in 22 overs. (Manoj Rajan 41, Birinder 33, Viresh Sharda 32, Jugraj Singh 19 n.o. Vijay Gulati 5 for 28, Rakesh Purang 2 for 13). JAL XI:- 106 all out (Manjit Gulati 27, Rakesh Purang 20, Ajay Sikka 4 for 19, Viresh Sharda 3 for 21, Birender 3 for 16). IInd match:- Brief Scores:- Gymkhana CC XI:- 171 for 7 in 22 overs. (Jagdish 37 n.o. Vikram Sharma 34, Kamal Walia 33, Amit Bhardwaj 3 for 48, Anil Chaudhary 2 for 32). PGI XI: 132 for 8 (Raman Sharma 47 n.o. Rajinder 21, Raman Abrol 19, Jagdish 3 for 20, Pardeep 2 for 23, Banish Singla 2 for 10).